Oil Tanks Ashville is an environmental company well versed in proper North Carolina oil tank removal procedures. We provide the residents of North Carolina efficient and completely effective solutions for removing an oil tank. Many underground storage tanks have been left abandoned in NC. If not done correctly, the abandonment process can contaminate the surrounding soil and water. When it comes choosing between removal of an oil tank or abandonment, removal is a better choice. At the Oil Tanks Asheville, we can provide the necessary phases for proper oil tank removals. Many homeowners are choosing oil tank removal over abandonment, and we can help you decide which technique is better in your circumstances. After determining a plan of action, we will be sure to correctly execute the project from start to finish. Is Oil Tank Removal in NC Necessary? The average life of an oil tank is fifteen years. Older tanks are at risk for deterioration and corrosion. At Oil Tanks Asheville, we strongly encourage homeowners that have been living in their house for over a decade to remove their oil tank completely. Removing an oil tank requires several steps. We make sure to thoroughly complete any oil tank removal in NC through the proper procedures. We will sample the soil and groundwater for contaminants, provide detailed tank closure documentation, locate any unknown underground tank systems, complete and submit necessary permit applications to local government agencies, and excavate and remove the tank system. When it comes to deciding whether to remove or abandon your oil tank, there are several facts to keep in mind. First, it is usually more cost efficient to completely remove your oil tank in New Jersey. Our oil tank removal experts will manage state and federal rebates as well as those from utility companies during this process. Additionally, abandoning an oil tank requires additional soil testing and analysis, even if it does not appear to be leaking. This is due to the possible pinhole leaks in the oil tank that may not be visible during the abandonment procedure. These leaks not only affect the homeowner, they can also cause problems for neighbors and nearby businesses. This testing adds additional expense to the process. Removal of the oil tank will not require this extra process, and expense. More often than not, oil tank removal is a better option for NC residents. By removing the entire structure from the ground, there will be no question as to whether or not the tank was abandoned properly. Likewise, many potential buyers prefer that the oil tank be removed. Removing an oil tank and converting to natural gas is an environmentally friendly solution for home heating. Our environmental services company in NC can remove your oil tank, whether it is above or underground, in a timely and cost effective manner. We make sure to stay in accordance with environmental regulations during the entire process of oil tank removal and remediation. 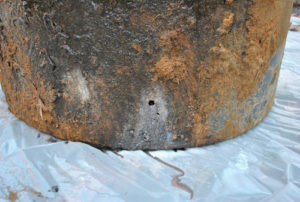 Contact us at the Oil Tanks Asheville, for more solutions and tips on oil tank removal in NC. We can help provide you with the appropriate plan to get started on your oil tank removal project. We will serve as a single point of contact for all information and project execution to accelerate the process.